Study-Sleep-Train-Repeat. Can young athletes do it all and why they should! Throughout the world many young athletes are pushing themselves to the limit with high training volumes on a weekly basis, whilst trying to juggle school, homework, social pressures, and other extra curricular activities. In Asia especially, the pressure to maintain the highest possible school grades, as well as being competitive in every other aspect of life, including sport, is faced by youngsters on a daily basis. It seems that sport is also the first to blame when school grades are not close to perfect, with parents questioning how long training hours can be of any benefit, when the chances of success are unlikely and never guaranteed in the sporting arena. We all know the proven benefits of moderate exercise, of about 60 minutes per day, and how it has a positive effect on the brain and bodily functions. In this instance however we are talking about those involved in competitive endurance sport, kids from 7-17 years now training up to 25 hours per week, most of the year round. These long hours cause fatigue and obviously take up study time, but they are essential in becoming a competitive athlete. We should not hide the fact that to be competitive in many sports on a national or international level, long hours training are needed at a young age. When athletes reach maturity, they will then have a sufficient base to permit even harder training, without injury or excessive fatigue. 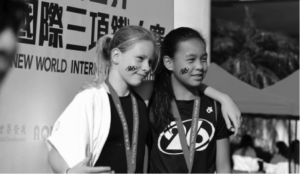 Using Hong Kong as an example, where schools start early and finish late, the emphasis on good grades is of paramount importance, and travel cuts big chunks out of a students day, it’s not surprising why sport takes a hit. High pollution levels, and disorganized sports federations are also to blame for Hong Kong’s lack of top results in endurance sports. Parents are right to ask the question “What’s the point of my child devoting all these hours to sport when they could be spent studying?”. As a coach, I see many talented youngsters drop out or consider dropping out of competitive sport. This is usually because of the reasons mentioned above. It is hard to predict exactly, however, several young athletes I know could probably have made it to the top, but were prevented from doing so by parents who did not see the point, or in some cases due to them not receiving good advice that would have shown them why they should have pursued their sporting ambitions. My goal as a coach, is to keep athletes in a long term development programme and inform their parents on how training hours are extremely beneficial in the long run, whether that athlete makes it to the top internationally, or not. I always advise parents to keep their kids in competitive sport programmes until they have finished school and can make key decisions, as to whether or not they want to take a shot at going full time. I should add, that a lot of athletes only start showing their true potential in endurance sports once they reach the age of 17-18 years anyway. All of the above are exactly what schools, universities and prospective employers are looking for in any applicant and therefore will give athletes a competitive advantage over everybody else. When talking with several high level industry professionals, it is quite evident that they see these benefits when dealing with the thousands of applications they receive every year. This is also true for university administrators. Few roles exist in isolation, so people skills are just as important as knowledge. Sports are great for developing confidence, camaraderie and team skills and these are precisely the interpersonal skill set that employers seek. Fred clarifies “We see a significant number of talented individuals applying each year but many have focused solely on schooling to the detriment of developing other skill sets or interests. Those with diverse interests are the ones that stand out”. There are certainly many demands on young adults today but Fred offers some words of wisdom to aspiring athletes “It can be hard to combine both sport and academics but it is not impossible. It simply requires making sacrifices to get ahead, drive, ambition and of course parental support is essential”. As Fred mentions, it is of course important to keep school work up as well. In fact, if parents notify me of falling grades we try and find a way around this. I have spoken to school teachers and students alike to maintain both training and studying to continue at a high level; it is possible. The key to this, is to have the athlete, coach, parents, and teachers all on the “same page”, and aiming for the same goal. Take swimming or triathlon as a sporting example, you will find a very high percentage of an elite start list have either graduated or are currently studying at university. One of the saddest concepts I have come across in Hong Kong, is coaches who suggest students pull out of school to train full time, especially if the athlete displays limited potential. Other key fundamentals of coaching, are honesty and integrity when it comes to their athletes, and not leading anyone to think they are better than they are, coaches must aim to produce well rounded individuals, of course academic achievement is part of this. Adrian J Halkes, a Barrister-at-Law with a history of athletic competition puts it this way, “when I’m putting a team together I find that people who have a history of competing in the athletic arena usually have a better grasp of the fact that without proper preparation and hard work, winning is unlikely to follow” he adds “competitive sport also results in people who are more self-aware and therefore much less likely to over-reach their own abilities, something that is absolutely essential in a professional environment”. My message to all aspiring athletes is to both study hard and train hard. This can be done to the highest level and both will supplement each other extremely well. If you make it as a professional athlete you will need to be smart when managing your career and ensure that you have something to fall back on when you’re not as fast as you once were. If you don’t make it, or decide against taking that pathway, then you will still have all the attributes employers are looking for, with the qualifications to match and a good fitness base. Put yourself in the driver’s seat and give yourselves the best possible chance of succeeding in your choice of profession by taking your sporting career as seriously as your academic one. Andrew Wright, Bsc Sports Science (Hons), Msc Sports Science, Elite triathlon coach, ex ITU athlete.